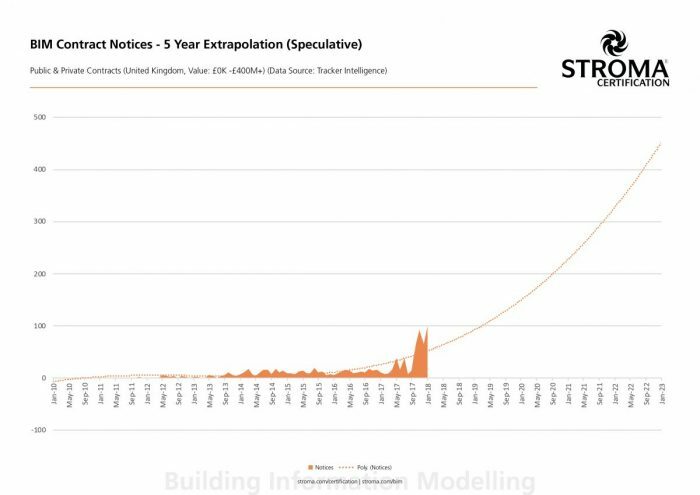 I decided to take some time in analysing the number of BIM contract notices published over time on various procurement portals. 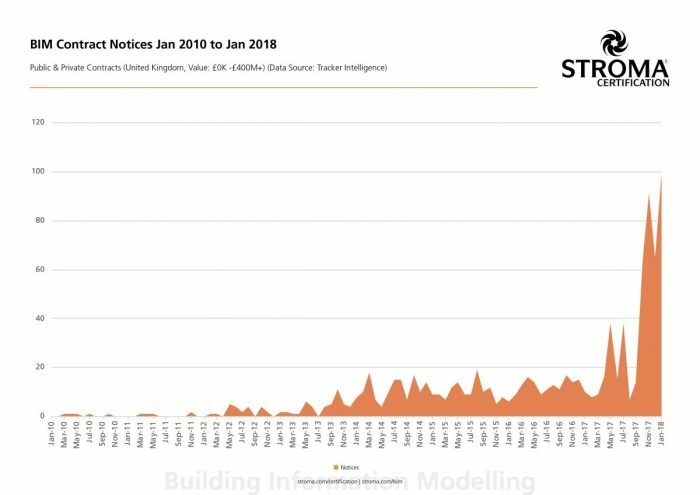 My research considered data from January 2010 to January 2018 for contract notices containing a BIM requirement. This includes public and private contracts, values ranging from £0K to £400M+. (The research includes analysis from Tracker Intelligence). The results show that we have now reached the end of the beginning of the BIM story. When analysing the data I found it useful to employ the Diffusion of Innovation concept pioneered by Everett M. Rogers in 1962. Rogers postulated that adoption of new concepts could be split into five distinct categories: Innovators, Early Adopters, Early Majority, Late Majority and Laggards. I applied those titles to explain the relative adoption of BIM within the construction industry. Having looked back at the procurement statistics between Jan 2010 and Jan 2018, it tells an interesting story. During 2010 and 2011 there were either none or minimal contractual notices. This may well have been a “lonely BIM” period for those engaged in projects. However, these pioneers were the first of the innovators, which would have embarked on the industries digital journey. More innovators came onboard to deliver BIM during 2012 to 2014 saw a steady uptake of BIM projects as clients and industry became more familiar with the benefits of 3D modelling. Summer of 2014 to Winter 2016 saw a steady requirement of BIM from clients. This in turn encouraging the Early Adopters to come on board with BIM. During 2016 there were twice as many public notices as compared to private. However, 2017 saw a fivefold increase in private contracts to that of public, whilst the overall BIM contract notices increased just over two-fold. October 2017 to Jan 2018 has seen a further five-fold increase in private notices versus public notices. Also, the number of contracts with a BIM requirement within them is most definitely on the increase as can be clearly seen from the chart. What of the Late Majority and Laggards, those who have not yet engaged with the digital evolution in the construction industry? As BIM adoption grows and filters through the supply chain, even the most reactionary company will eventually have to accept digital construction as part of its normal process. With the emergence of Centre for Digital Built Britain (CDDB) it is clear that Government remains committed to transforming the UK construction industry. I would not be surprised to find the chart continuing in the vein illustrated below. Stroma Certification would welcome the opportunity to speak with companies about BIM adoption and where you fit within a digital supply chain. Register for a free BIM webinar (link to https://www.stroma.com/certification/bim/webinar-registration) on our website or call 0845 621 11 11 to make an enquiry.